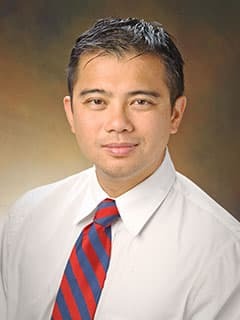 John Chuo, MD, MS, is an attending neonatologist and Medical Director of Telemedicine Children's Hospital of Philadelphia. Dr. John Chuo is Neonatal Improvement Officer and Medical Director of Telemedicine at Children's Hospital of Philadelphia (CHOP), and associate professor of pediatrics at the Perelman School of Medicine at the University of Pennsylvania. He completed his neonatal fellowship from Children's Hospital in Boston and masters in Medical Informatics from the Harvard-MIT Health Science and Technology program in 2004. He received training as a quality improvement advisor from the Institute for Healthcare Improvement in 2010. His focus on implementation methods in collaboratives, medication safety, and development of quality focused decision support systems. He is an experienced educator for medical, post-graduate, allied health, and health professionals. Dr. Chuo has extensive clinical experience and is an authority on patient safety and quality informatics. Chuo J, Lioy J, Gerdes J. Drivers of referrals to a children's hospital neonatal-infant intensive care unit. J Perinatol. 2019 Feb;39(2):295-299. doi: 10.1038/s41372-018-0297-2. Epub 2018 Dec 20. Chuo, J., Aftab, S., Heimall, L., Soorikan, L., Provost, L., Ades, A. : Standardizing the practice of securing endotracheal tubes in neonates. Patient Safety and Quality Healthcare Oct 2012 Notes: (Submitted). Chuo J, Paliga JT, Lioy J. Creating an Effective Quality Improvement (QI) Process for Airway Emergencies. In: Sobol S, Lioy J, ed. Disorders of the Neonatal Airway. New York: Springer; 2015. p. 385-389.